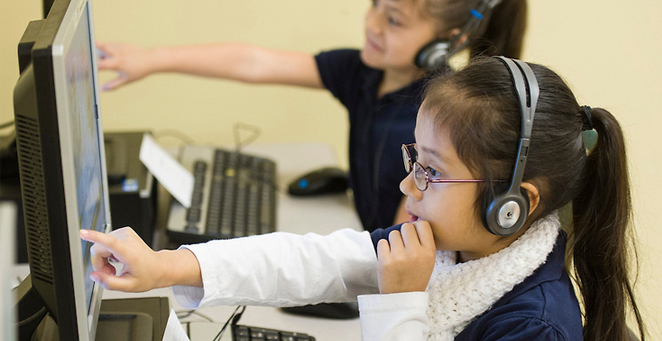 In support of its Literacy By 3 movement and Read Houston Read initiative, HISD has elected to extend its partnership with myON, a reading website that gives students access to thousands of titles for free. This entry was posted in Literacy, Read Houston Read, Summer programs, Volunteers and partnerships and tagged myOn, reading on February 5, 2015 by HISD Communications. 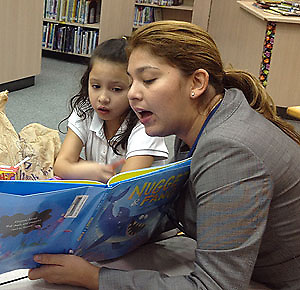 Betty Garcia from HISD’s Student Assessment Department reads aloud from “Nugget & Fang,” by Tammi Sauer, to Rodriguez ES students. On the last two days of every work week, between the hours of 11 a.m. and 1 p.m., you’ll find members of HISD’s Student Assessment Department making their way across the busy intersection of Chimney Rock and Glenmont. Why are they braving the lunch hour traffic? To get to Rodriguez Elementary School, on the other side of the street. This entry was posted in District V - Sue Deigaard, Elementary Schools, Literacy and tagged Literacy By 3, reading, Rodriguez ES on October 28, 2014 by HISD Communications. 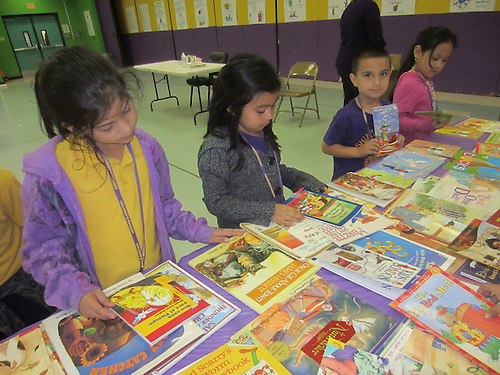 HISD’s Millionaire Club is a literacy initiative designed to encourage students to read for pleasure during the summer months. Each week, we’ll catch up with one HISD librarian to find out what’s on his or her reading list. 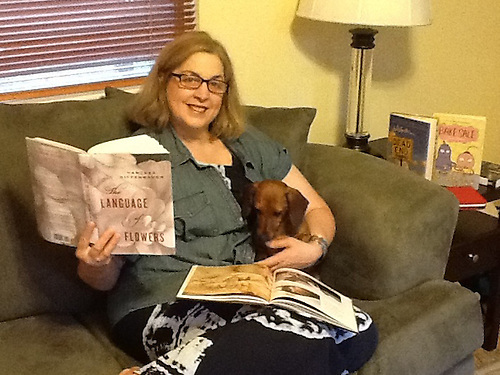 This week, we spoke with Jo Reed, the librarian at Scroggins Elementary School. This entry was posted in Elementary Schools, Summer programs and tagged millionaire club, reading, Scroggins ES on August 5, 2013 by HISD Communications. 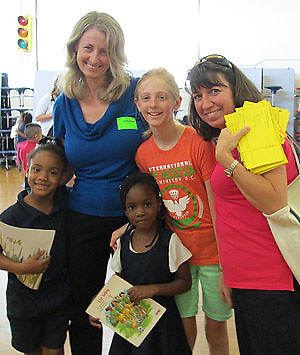 Most Houston Independent School District students will be spending their summer vacation having fun and doing things to get ready for the upcoming school year, including reading a few good books. Students in all grades are participating in the Millionaire Club, a summer reading program that the district developed five years ago. This entry was posted in Uncategorized and tagged library, millionaire club, reading on June 3, 2013 by HISD Communications. The number of Houston ISD students taking the SAT college entrance exam has nearly doubled in just two years, and the number of graduates scoring at college-ready levels on the SAT has hit a new record, according to figures released today. A score of 500 or better in each of the three SAT subjects – reading, math, and writing – is considered to be a strong sign that a student is prepared for college-level work. The Houston Independent School District’s seniors of 2012 posted significant gains in this area since 2010. In just two years, the number of HISD students scoring 500 or better has risen to 2,056 in reading (26 percent increase); 2,738 in math (41 percent increase); and 1,816 in writing (20 percent increase). In 2011, HISD became one of the very few school districts in America to offer every high school junior the chance to take the SAT for free during the school day. Students also received free access to the College Board’s online SAT test preparation materials. Typically, students must pay a fee and sign up to take the SAT on a weekend. HISD’s effort to increase access to the SAT exam paid off, with 9,480 students in the Class of 2012 having taken the SAT, compared to just 4,920 in the Class of 2010. This represents a 93 percent increase in students taking the SAT. Two years ago, 52 percent of HISD seniors attempted the SAT at some point during high school. Now, 92 percent of students are taking the SAT by their senior year. The rise in the number of HISD students taking the SAT was so significant that HISD accounted for half of the total statewide increase in the number of students who sat for the exam. This increase in college readiness comes at a time when HISD graduates are earning more scholarship money with each passing year. In 2012, scholarship offers to HISD students exceeded $180 million, compared to $97 million in 2010. The number of students scoring at the college-ready level has risen in every subject among every racial and ethnic group since 2010. Among African American students, the number scoring 500 or better has increased 33 percent in reading, 55 percent in math, and 35 percent in writing. The number of Hispanic students reaching the college-ready level has jumped 40 percent in reading, 73 percent in math, and 29 percent in writing. Among white students, the number reaching the college-ready mark has climbed 23 percent in reading, 21 percent in math, and 16 percent in writing. The number of Asian American students hitting the college-ready mark is up l percent in reading, 4 percent in math, and 3 percent in writing. SAT participation rates increased rapidly for students of every race and ethnicity over the past two years. For the Class of 2012, there were 2,654 African American students tested, compared to 1,508 in 2010, an increase of 76 percent. The number of Hispanic students tested jumped from 2,165 in 2010 to 5,063, a 134-percent increase. Among white students, the number tested increased from 673 in 2010 to 890 in 2012, an increase of 32 percent. The number of Asian American students tested now stands at 456, compared to 388 in 2010, a difference of 18 percent. As the number of students taking the exam dramatically increased, average scores dropped predictably. The College Board has reported that scores tend to decline as the number of low-income students and first-generation immigrant students take the exam. In 2012, the average HISD reading score dropped 35 points to 410, while the average math score declined 31 points to 439, and writing dropped by 34 points to 406. Average SAT scores also declined nationally and statewide. If we eliminate the bottom 3,259 scores in 2012, which is the difference in the number of students tested from 2011 to 2012, average scores in each subject would increase substantially. The average composite score for the top 6,225 students tested in 2012 is 1,424, compared to 1,355 for the 6,225 students in the Class of 2011 who took the SAT. Although this is not a statistically valid comparison to make, it does offer some valuable insight into the impact that increasing the testing pool has on average scores. This year, HISD launched a new and improved curriculum designed with the input of thousands of teachers. The new curriculum is aligned with state and national standards and will prepare students to meet increasingly tough academic standards. The new curriculum also places an emphasis on every child reading at or above grade level. Moving forward, high school teachers and counselors will be encouraging more students to take advantage of the free online SAT test preparation materials that are available from the College Board. This entry was posted in Achievement/Recognition and tagged college, math, reading, SAT scores, test, university on October 4, 2012 by HISD Communications.